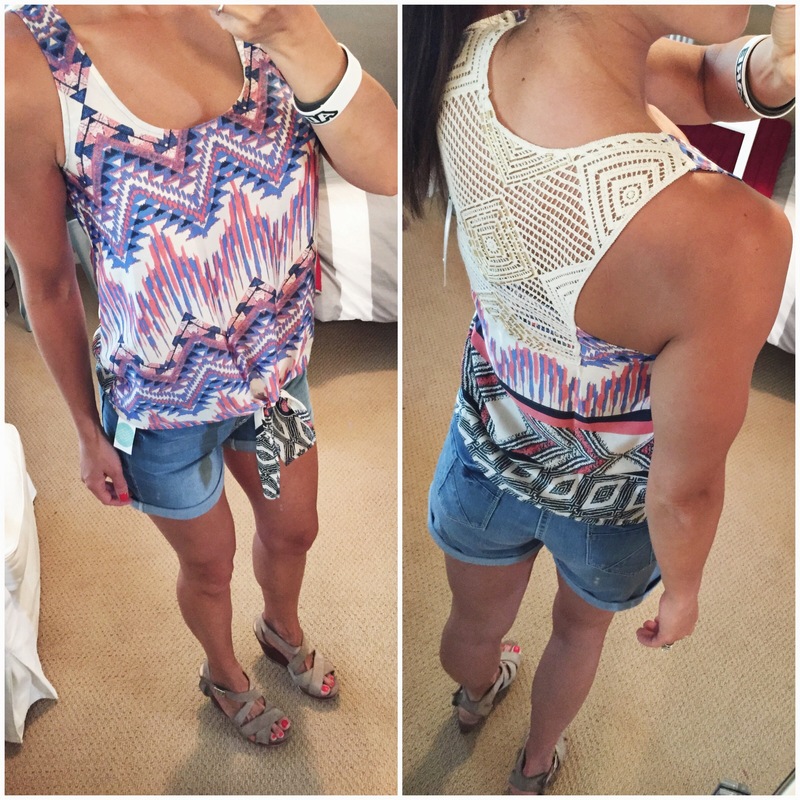 All rested up from an awesome 4th of July weekend, and here to share my latest Stitch Fix delivery. Are you still new to the Stitch Fix world and have never treated yourself to one yet? Well then let me tell you about what you’re missing out on. * Try everything on at home with your own clothes, shoes, accessories etc. I have been receiving Stitch Fixes for over a year and half now and they just keep getting better and better. Im not exaggerating when I say that about 75% of my closet is made up of Stitch Fix items. They are all unique, colorful, fun, and things I would have never picked out on my own. This service is so convenient to me since I never get around to shopping at a mall, and if I do Im towing two little dudes around with me who scream as soon as we step foot into a “Mommy store”. Basically Stitch Fix makes me feel pampered while being so simple and affordable. Even if I keep just one item it was worth it…to this day I have never had an all 5 send back! So without further adieu here is my fabulous July Fix. I have until Thursday to make my decisions so since I am right on the edge of keeping all five I would love your feedback on which are definite keepers. Ill just go ahead and tell you now that I am definitely keeping this top. Im in love with it. You can’t see but on the back there are actually little gold beads sewn into that crochet part just adding that extra detail that I love about their clothing. This is one of those shirts I wouldn’t grab off a rack at the store, but when tried on with my own clothing I realized how much I liked it. Im thinking white skinny jeans, heels, my light denim vest and we have a super fun date night or girls night out outfit! This is another no brainer keeper. I love that my stylist never sends me black clothing (because that’s all I would buy myself) but when she does it’s perfect and has something special about it. Hello those sleeves!! I kind of want to wear this dress everyday and I’m putting a date night on the calendar just because of it! This is one I keep going back and forth on. I absolutely love the color and how comfortable it is, it’s just that it’s a whole lot of fabric for me for this time of year. When I wear it it feels heavy, but when I see a photo of myself in it I do like how light and flawy it looks. HELP!! So Ill be honest, these shorts are just ok. BUT if I end up keeping all 5 items then it would be worth the 25% off since I don’t dislike them. They are certainly comfortable but just a little baggy, and Im not a fan of the high waist on them. I do like the wash and the back pockets. Im leaning towards sending these back with the maxi dress so I would love some feedback. Well that was fun! If it weren’t for Stitch Fix my entire wardrobe would be workout clothes so I am very thankful for having the help of someone who knows how to dress me. Here is a little tip…if you see something you like from my fix you can actually request it in your own fix and they will do their best to include it. You can also create a Pinterest folder and call it “My Stitch Fix Style” and pin photos of items you like, cut and paste that folder link to your stylist and they can really get an idea of your taste. Ever since doing that my fixes have been spot on! I hope you all had safe, festive and fun holiday weekend! Have a great start to your week and thanks as always for checking in! 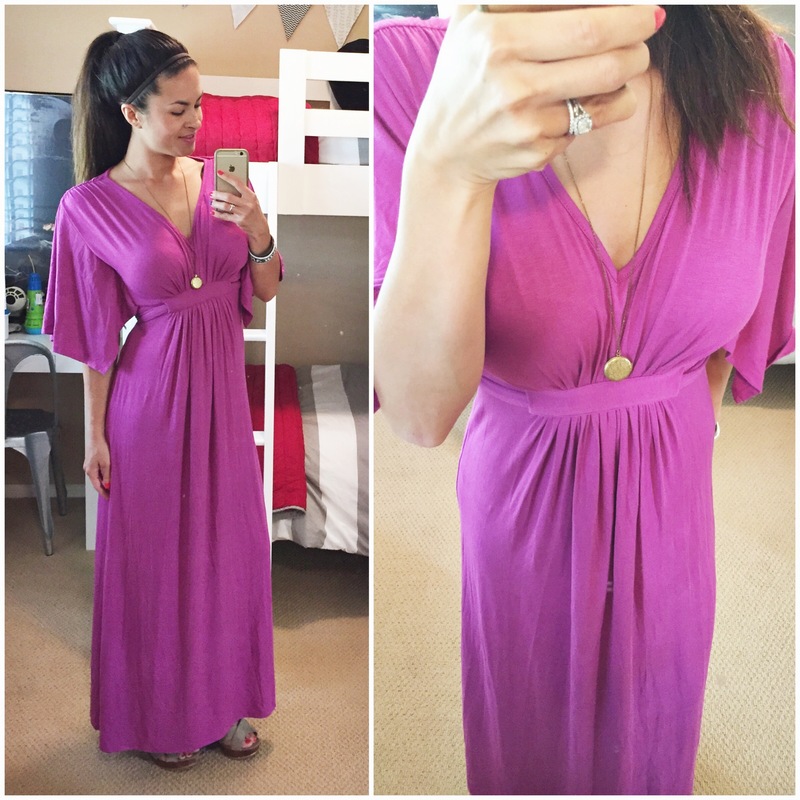 Yea a Stitch Fix post! I think everything looks great on you but the most flattering are the tops. I’m not 100% sold on the maxi dress and while I think the shorts look great, if you don’t like them a ton, you probably won’t wear them as much as other things so why fill your closet with stuff you don’t love. Of course take my fashion advice with a few (hundred) grains of salt. Okay, I’m obsessed with that front tie shirt. Definitely requesting that in my next fix! Looking’ good mama!!!! I love both tops. The Black Dress is hot. The purple dress would be great if Traveling in Europe. The jeans I thought looked great but I couldn’t see the high waist part. I’m really curious who your stylist is. I LOVE the pieces she sends you. I want to request her. Kayla did one of my fixes and that was the closest I got to my style, which seems to be very similar to yours. Hi Ynonne, I actually don’t know who my stylist was on this….I seem to get someone new every time. Just wondering who you’re stylist is and where your shoes are from in all these photos? Hi EMily- I don’t know who my stylist is, I seem to get someone new every time. My shoes are old Steve Maddens.